Ivy Lab is the amalgamation of three of the hottest talents in drum & bass right now; Halogenix, Sabre and Stray. The trio formed after sharing an appreciation for each other’s solo work, and after a number of sublime releases including the blissful ‘Oblique’ ft. Frank Carter, it’s clear to see that the three form a rather formidable force. Stray is a young producer hailing from London. He wants to ‘break away from the bounds of the drum & bass genre and focus on the more musical side of production’, and this is audibly evident in several of his releases. Sabre is one of the most highly respected drum & bass DJs in the scene. He, like Stray, wants to break the mould of drum & bass and breathe life into the genre. He’s got an extensive back catalogue of soulful releases under his belt, including the magical remix of Brian McKnight’s ‘Stay or Let It Go’. Halogenix is lesser known on the radar, but his anonymity doesn’t imply a lack of talent, not at all. He blends minimal basslines with intricate drum beats to form hard-hitting and dark tracks – it’s no wonder he too has received high praise from a host of respected artists. The trio’s respective styles work together so well, and it’s no wonder they’re currently at the helm of the scene. Their other major release and stand-out track, ‘Afterthought’, is a fitting example of why there is so much hype surrounding them. This track once again features the vocals of Carter, whose soulful, melodic voice compliments the trio’s work to a tee. The track ‘Brat’ ventures in a different direction to the trio’s other work, and is evidently heavily based on the work of Halogenix. It’s far darker than the two aforementioned tracks, and is fitting for the Critical label. If soulful drum & bass is your thing, Ivy Lab are for you. 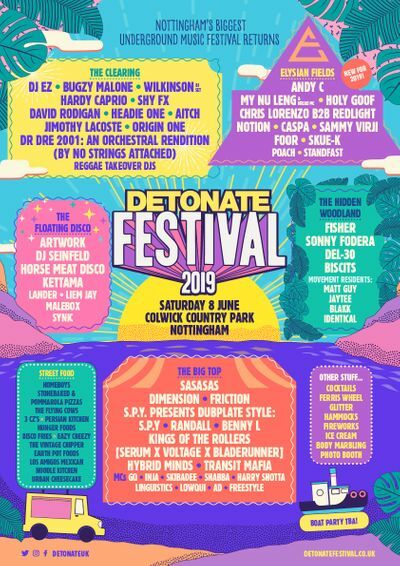 Catch the trio at Detonate on April 26th.